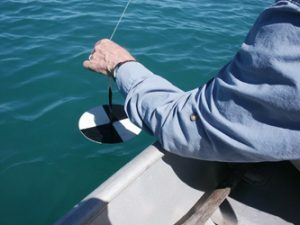 Lake monitoring in Oakland County! 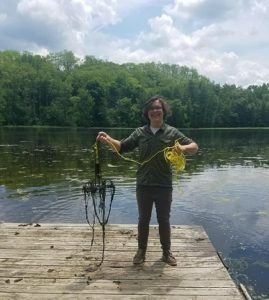 For 14 years, HRWC has worked with lake residents across Michigan through the Cooperative Lakes Monitoring Program (CLMP) by training and assisting them with monitoring the water quality of their lakes. This year, thanks to support from the Oakland County Board of Commissioners in covering the registration costs, over 60 lakes in Oakland County have newly enrolled! Prior to the 2018 Oakland County Healthy Lakes Initiative, the CLMP covered approximately 250 lakes across Michigan–12 in Oakland County. To have 60 plus new lakes register in one year is both an incredible feat and a great challenge for us to tackle! To onboard so many new lakes into the CLMP, HRWC hired an intern (me!) to coordinate directly with every new volunteer group. I had the opportunity to meet the lead volunteers of each lake during our May introductory training session. These wonderful people come from so many different walks of life, but they each share a passion for becoming stewards of the natural world we inhabit. I am absolutely thrilled to spend my summer visiting one-on-one with each of these individuals and touring the beautiful lakes across Oakland County. These visits are designed to coincide with the emergence of the aquatic plants that populate the lakes. While many consider these slimy organisms to be weeds, they are in fact an integral part of the aquatic ecosystem, providing habitat for fish and bugs as well as soaking up the excess nutrients which pour into water bodies due to urbanization and agriculture. Unfortunately, Michigan’s lakes are threatened by several species of invasive plants. 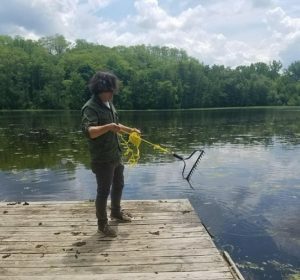 CLMP volunteers have taken on the task monitoring the spread of these eco-criminal offenders, namely curly-leafed pondweed, starry stonewort, and Eurasian watermilfoil. They are also on the look-out for Hydrilla, an extremely aggressive invader that has been creeping its way toward our state. Hydrilla has yet to be found in Michigan, and hopefully our network of volunteers can identify its presence early enough to prevent its spread. The volunteers will receive on-site training by HRWC staff (me again!) at their respective lakes to demonstrate the use of our custom-built plant sampling rakes in mapping out any incidents of these exotic plants. Why monitor these lakes? How is the data used? Our volunteers over the course of this summer and into the future will collect a wealth of data, a sample size that would be difficult to achieve by a lone government agency or academic institution, which is uploaded onto an accessible online data exchange on micorps.net. Because of this, data sets collected by volunteer programs are being increasingly looked to as a source for long term and geographically-broad data, which is coveted by scientists trying to track the spread of invasive species and the effects of environmental stressors such as climate change, pollution, and urbanization. These data sets can also be used to justify funding for restoration projects, inform decisions about real estate values, and to influence local and statewide environmental policy. For these reasons, as well as for their own better understanding of the health of the lakes they love, our volunteers are performing an invaluable public service. I would like to close out this blog post by thanking our them dearly for their contributions. A little bit of monitoring goes a long way! -Niklas Krantz is our CLMP Invasive Plants Intern this summer. He is majoring in Biological Sciences at Wayne State University. You can catch Nik featured in a recent story from the Environment Report, “Bugs can tell us whether a river is healthy,” by Lester Graham.